Traditionally the Goddess/Empress is seated in this image on a throne as she represents sovereignty, in other words she is the throne. 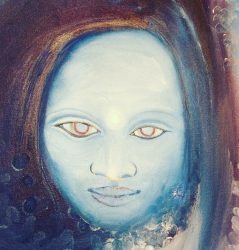 She is the doorway through which we enter this life in the first instance from the womb of our mother, and spiritually she represents the doorway that we must find within, open and journey through so that we may create ourselves anew. We can also think of her as Gaia or the soul of our planet. There are two eagles on the Soulscapes card and when painting the image one of these was intentional which is the one that is above the head of the figure, however the yellow eagle head on the right hand side of the image just happened as I was scraping the red paint on the background with a palate knife. It wasn’t until the image was finished and I stood back to look at it that I saw the second Eagle. In this Archetype there is a strong female figure whose opposite, partner or counterpart is the God, or Emperor, but neither have power over each other they simply compliment each other as it should be within all strong healthy human relationships. Think of the Yin and Yang in the oriental traditions and as humans having within both a feminine aspect and a masculine aspect. Depending on the maturity of our personality one of these archetypes may dominate and there may need to be some work done to achieve a balance between the dual natures. In a reading this card may suggest someone who is very feminine and centred in their domestic life as a mother and carer. In old celtic oral traditions the triple forms of the Goddess and God each had their reflection that we encounter as characters in bardic tales such as the Vita Merlini. In the Waite/Coleman Smith version of this image we see a shield emblazoned with a phoenix which suggests that she is the gateway through which one has to pass in order to live, and in a mystical sense being reborn through the Mother Archetype one is initiated or ‘born again’ into greater mysteries. In some tarot images she is stepping on a crescent moon and heavily pregnant suggesting again that she is regeneration.